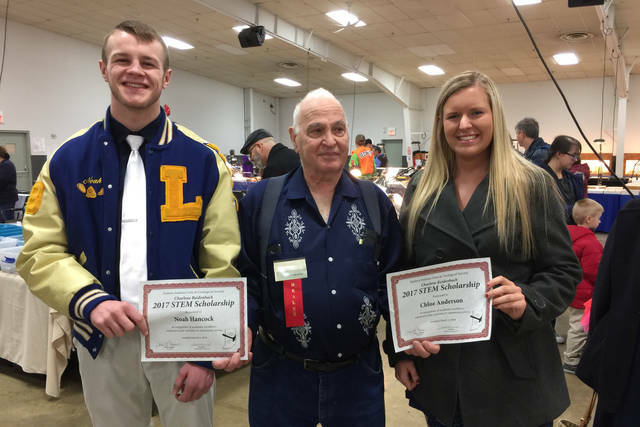 On behalf of the Eastern Indiana Gem & Geological Society, club member John LaMont presents the 2018 Charlene Reidenbach STEM Scholarships to Noah Hancock (Lincoln HS) and Chloe Anderson (National Trail HS). The award was presented at the Richmond Gem and Mineral Show, March 4. RICHMOND, INDIANA — National Trail High School senior Chloe Anderson was the recipient of one of two 2018 Charlene Reidenbach STEM scholarships presented by the Eastern Indiana Gem and Geological Society of Richmond, Indiana. The awards were presented at the annual Richmond Gem and Mineral Show, Sunday, March 4. Anderson is a senior at National Trail High School in New Paris.. She is the daughter of Douglas and Dale Anderson. She plans to use the $500 scholarship to pay for expenses at Indiana University East where she will study human life sciences in order to become a physical therapist. “[Science classes] made me realize what I would love to do for the rest of my life, allowed me to find my passion, and made it easier for me to pursue my dream. I would have never realized what career I wanted to choose for the rest of my life if it were not for earth sciences,” Anderson said. Besides pursuing academics in high school, Anderson has also been active in sports and extracurricular activities. She was captain of the girls soccer team and was named to the Cross County Conference All-Academic Team. She is the vice president of her senior class and is a member of FFA, Student Council, National Honor Society and the Renaissance Club. Additionally, she served as New Paris Applefest Queen and volunteers in the Youth SAY Soccer Program, at Vancrest Nursing Home in Eaton, at the Preble County Pork Festival, and at the food bank in New Paris. Noah Hancock received the other scholarship. He is the son of Frank and Kelley Hancock and a senior at Lincoln High School in Cambridge City, Indiana. He plans to attend Purdue Polytechnic Institute, where he will study engineering technology in order to become a process engineer. https://www.registerherald.com/wp-content/uploads/sites/41/2018/04/web1_anderson2018331193921272.jpgOn behalf of the Eastern Indiana Gem & Geological Society, club member John LaMont presents the 2018 Charlene Reidenbach STEM Scholarships to Noah Hancock (Lincoln HS) and Chloe Anderson (National Trail HS). The award was presented at the Richmond Gem and Mineral Show, March 4.